I became a birder in my early 20s when I moved to Costa Rica to play in the Orquesta Sinfónica Nacional. One of the things that puzzled me from the start were descriptions of the seasonal migrations of birds within that tiny, lovely, benign country. I grew up in a place where bird migration seemed not only logical, but frankly the ONLY sensible thing to do in winter. But why would some birds move up and down mountains each year in a place where the weather is always warm and food hangs from the trees wherever you go? few other researchers were asking similar questions in other parts of the world. Part might have to do with the perception that these are not “real” migrations. It turns out that we have LOTS of birds in North America that make similar types of movements. In fact, roughly the same proportion of the North American avifauna migrate up and down mountains as does the Costa Rican avifauna—20% to 30% depending on how you count it. With the exception of the Himalayas, reports from other avifaunas seem consistentwith this figure. The fact that such movements are often partial (not all birds migrate), facultative (not genetically hard-wired), and short-distance actually makes them more attractive subjects for many types of migration research. We have far better chances of determining what ecological conditions tip the cost-benefit balance toward migrating in species that have built-in control groups in the form of resident individuals. If we are to protect our avifauna for future generations, understanding these movements will be as important as understanding the marathon flights of the migration poster children. This entry was posted in 2017, International, X and tagged migration on 30 Mar, 2017 by Birdlife20 owner. Malawi er et land preget av avskoging. Den enorme befolkningsveksten i det lille fattige sentralafrikanske landet gjør at trykket på skogsområdene er stort. I snart fem år har NOF jobbet med å ta vare på viktige fugleområder i Malawi. En av dem er skogsreservatet Ntchisi. Ntchisi-regionen i Malawi var tidligere et enormt skogdekt område i den sentrale delen av landet. Deler av disse skogsområdene var (og er) tropisk regnskog. Skogsreservatet dekker i dag et areal på ca. 75 kvadratkilometer, og ligger som en øy i et ellers tungt kultivert landskap. Den unike regnskogen og tilstøtende skogsområder har en rekke sjeldne fugle- og dyrearter. Blant annet er fuglearter som brunmaskeapalis, stjerneskvett, miombomeis, miombosolfugl og skjeggkobberslager ikke uvanlige i området. Malawi er et av verdens fattigste land. Med sin plassering midt i sentral-Afrika har de en rekke utfordringer. Tørke, flom og en enorm befolkningsvekst har gjort at presset på naturressursene er omfattende. Etter dårlige avlinger i 2016 ble hele 40 % av befolkningen i landet avhengige av ekstern bistand for å få mat. Befolkningen som lever rundt skogsreservatet Ntchisi talte ved prosjektets oppstart i 2012 omtrent 130 000 mennesker, men har nå økt til 200 000. Tallet stiger stadig. Den største utfordringen i Ntchisi (og Malawi forøvrig) er avskoging. Den årlige avskogingsraten i Malawi de siste ti åra lagt på nærmere 3 %, hvilket er helt i “toppsjiktet” globalt. Skogsarealene har tradisjonelt blitt brukt til både jakt og sanking av trevirke til bygningsarbeid eller ved. I tillegg kommer mange langveis fra for å hente ved eller lage kull, som de senere selger i byene. Det er tillatt å hente død ved i reservatet, men hogst av friske trær er forbudt. Blir man tatt for å gjøre det, kan man se fram til både lange fengselsstraffer og drøye bøter. Til tross for dette skjer ulovlig hogst dessverre jevnlig i Ntchisi. Denne hogsten er i første rekke gjort for å lage trekull. Trekull benyttes i liten grad på landsbygda, men i mer urbane strøk er det mer vanlig. Vakter fra både departement og stammene rundt Ntchisi patruljerer daglig skogsområdet for å sørge for at ulovlig hogst ikke forekommer. I tillegg til hogst er påsatte skogbranner et problem. Dette blir gjort for å åpne beitelandskap til kyr. 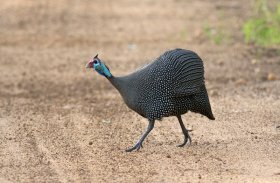 NOF sin samarbeidspartner er the Wildlife and Environmental Society of Malawi (WESM). Vårt hovedfokus er å ta vare på viktige fugleområder (Importand Bird and Biodiversity Areas – IBA) i landet, der Ntchisi er et slik område. Vi jobber også i to andre IBAer, Kasungu nasjonalpark og Dzalanyama skogsreservat. Hovedmålet i prosjektet er å bevare fugler, deres habitater og biodiversitet, samt og å arbeide med lokalbefolkningen for en bærekraftig bruk av naturressursene. This entry was posted in 2017, Scandinavian, X and tagged habitat, project on 29 Mar, 2017 by Birdlife20 owner. The Peesie Project is one of several that have received funding from the Heritage Lottery Fund as part of the Tomintoul and Glenlivet Landscape Partnership Project. Led by RSPB Scotland, the Peesie Project aims to conserve and enhance a network of important wetland areas along with working in partnership on adjacent farmland to provide homes for breeding waders. The partnership is supported by volunteers who help to survey the birds and there are still opportunities for people to get involved this year. Glenlivet and Tomintoul are a hotspot for breeding waders such as lapwings, known locally as Peesies, and curlews, both species that are suffering huge declines across the UK. In fact, the farmland in this area is home to some of the highest densities of breeding waders in Scotland. In 2016, 3255 hectares of farmland across 17 farms were home to 734 pairs of breeding waders including 384 pairs of lapwings, 203 pairs of oystercatchers and 97 pairs of curlews. It is hoped that the Peesie Project can safeguard this fantastic area as an important home for these birds for decades to come. This entry was posted in 2017, International, X and tagged project, restoration, waders on 28 Mar, 2017 by Birdlife20 owner. It looks like a spooky suicide when small, fluffy guillemot chicks leap from the cliffs and fall several hundred metres towards the sea – long before they are fully fledged. But researchers have now discovered that there is good reason behind this seeming madness. And you ask yourself why when you on a calm Arctic night watch the spectacular sight of dozens of young guillemots who leave their safe nests and flutter past the towering cliffs into nothingness. What is it that drives these young birds into something that to the eye seems an impossible survival strategy for the species? Researchers from, among others, Aarhus University, Denmark and Greenland Institute of Natural Resources, Greenland, have now discovered that there is good reason behind this seeming madness. They mounted small electronic loggers on the legs of a number of birds and recorded the birds’ flight and diving behaviour in detail. 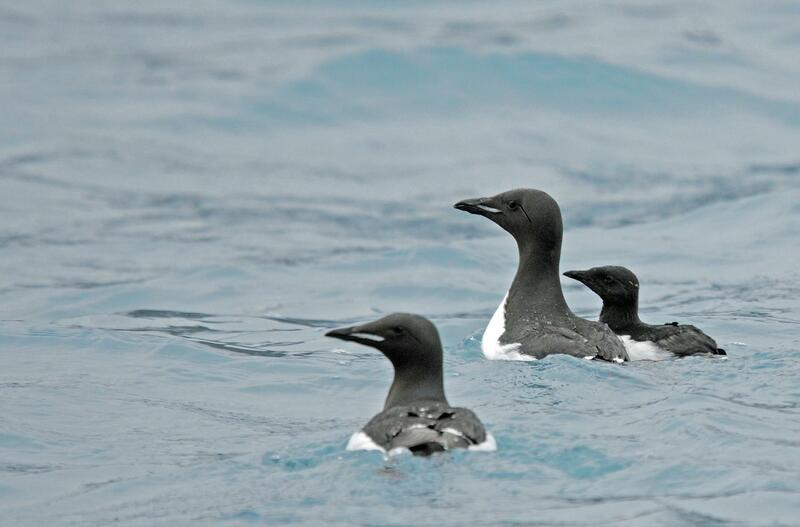 The guillemot (or thick-billed murre) is a seabird with a long life span. The female lays only one egg and thus has no more than one chick per year. Guillemots nest on cliffs in the Arctic, often in very large colonies with up to hundreds of thousands of birds—including Saunders Island, Thule, Greenland, where researchers have now studied their behaviour. The arctic summer is short and females must quickly produce an egg. After the chick is hatched and is still in the nest, both the mother and the father bring it food, which consists of small fish. 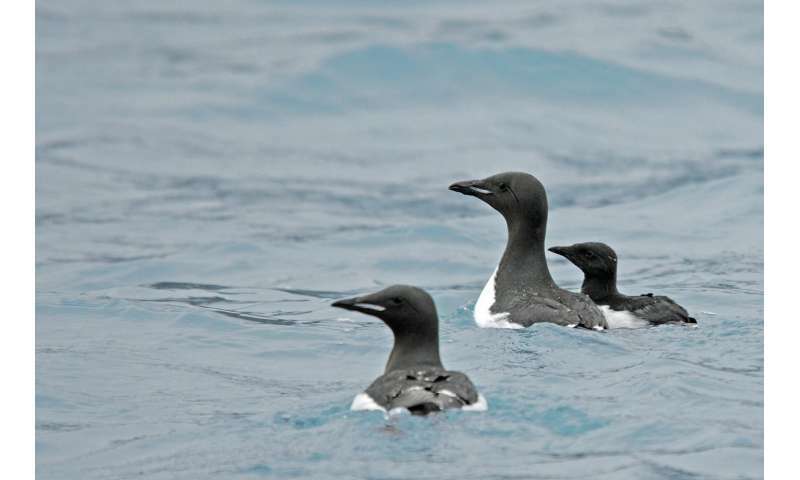 The small electronic dataloggers revealed that guillemots can dive very deep to find food—down to about 200 m. This is deeper than for any other flying bird. The distance from good fishing spots to the colony may be long, and in late summer the female is exhausted. This is when the male steps into character and guides his offspring to the sea and the indispensable pantry. And the male stays with his offspring for five to seven weeks at sea. “Our measurements show that the male feeds the chick twice as much as both parents could if the chick remained in the colony. This entry was posted in 2017, International, X and tagged research, seabirds on 27 Mar, 2017 by Birdlife20 owner. The 2017 spring hunting season will be open for Quail only following a moratorium imposed last year on the Turtle Dove in reaction to statements by the International Union for Conservation of Nature (IUCN) and European Commissioner for the Environment, Maritime Affairs and Fisheries Karmenu Vella regarding the sustainability of a spring hunting season on the vulnerable species. The IUCN had revised the conservation status of the Turtle Dove to ‘vulnerable’ in June 2015 in response to further population declines across its breeding range. This will be the first time since 2009 that Turtle Dove will not be legally hunted in spring. The hunting season will open via Legal Notices 82 and 83 of 2017 which authorise the dates between Saturday 25th March and Friday 14th April for hunting along with setting quotas for Quail. The national hunting bag limit has been set at 5,000 Quail and hunters are not to exceed the daily bag limit of five Quails and the seasonal bag limit of ten Quails per hunter. These have increased compared to previous years whilst timing remains the same with hunting being permitted between two hours before sunrise and noon for every day of the season. Hunters are required to report their catch by calling the telephone number specified in the Special Licence. The dates announced are meant to coincide with Quail migration and to avoid Turtle Dove migration which peaks around the second half of April. Just over 6,650 hunters have applied for this year’s season according to information supplied by the Wild Birds Regulation Unit (WBRU) during the last Ornis Committee meeting. Over 60 officers will be deployed from the Police and the Armed Forces of Malta. BirdLife Malta’s position in regard to this year’s spring hunting season remains that there is no scientific justification for spring hunting. Summing up the reasons for this…………. This entry was posted in 2017, International, X and tagged human impact, migration on 26 Mar, 2017 by Birdlife20 owner.